Following the 1880 Census, 32 new seats were apportioned. Three States lost 1 seat each, 13 States had no change in apportionment, 14 States gained 1 seat each, 6 States gained 2 seats, 1 State gained 4 seats, and 1 State gained 5 seats. Several States that gained one or more seats did not redistrict immediately, electing the new Representatives at-large, while one state (Maine) which lost a Representative also delayed redistricting, electing all of its Representatives at-large for this Congress only. There were a total of 8 Representatives elected from third parties, 4 from the Virginia-based Readjuster Party, 2 from the declining Greenback Party, and 2 Independents. The previous election of 1880 had had 10 Greenbacks and 1 Independent. California 3 Campbell P. Berry Democratic 1879 Incumbent retired. California 4 Romualdo Pacheco Republican 1876 Incumbent retired. 2 seats on a general ticket None (New seat) New seat. South Carolina 1 John S. Richardson Democratic 1878 Incumbent retired. South Carolina 5 None (open seat) New seat. South Carolina 6 None (District created) New seat. South Carolina 7 None (District created) New seat. ^ Five states held early elections between June 5 and October 10. ^ Included 1 Independent Democrat (and 2 "Readjuster Democrats" – see Readjusters elsewhere). ^ a b Dubin (p. 263) counts 192 Democrats, 5 Readjusters, 2 Independent Democrats, 119 Republicans, 1 Liberal, 2 Greenbacks and 2 Independents (along with 2 vacancies) at the start of the 48th United States Congress. ^ a b Includes 3 Independent Democrats elected to IL-02, KY-01, and NC-07. ^ a b c Includes 1 Independent Republican, Theodore Lyman, elected to MA-09. 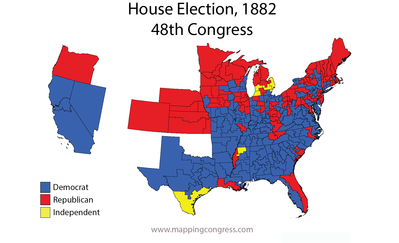 ^ There were two "Readjuster Democrats" elected to the previous congress in 1880. ^ a b Includes 4 Readjusters elected to VA-02, VA-04, VA-09, and VA-AL. ^ a b c d e f g h New seat or seats added without immediate redistricting. ^ a b c Includes 1 Independent Democrat. ^ a b c Independent. ^ Previous election had 1 Greenback. ^ Previous election saw 2 "Readjuster Democrats" elected to VA-07 and VA-09. ^ Seated after successful electoral challenge. ^ a b c d e f g Martis, pp. 136–137. Republican Congressional Committee, The Republican Campaign Text Book for 1882 (1882).